Lucky Horse Shoe Necklace : LOVE2HAVE in the UK! Here is our lucky horseshoe silver necklace. Ancient civilisations used to believe that the wearing of jewellery brought them good luck and still to this day certain symbols and items are thought to bring luck to their owner. We have all heard of the lucky horseshoe, a superstition that was considered to attract good fortune to a home if hung on the wall inside a house. With this piece, we have combined the ancient principle of wearing jewellery combined with the lucky horseshoe. 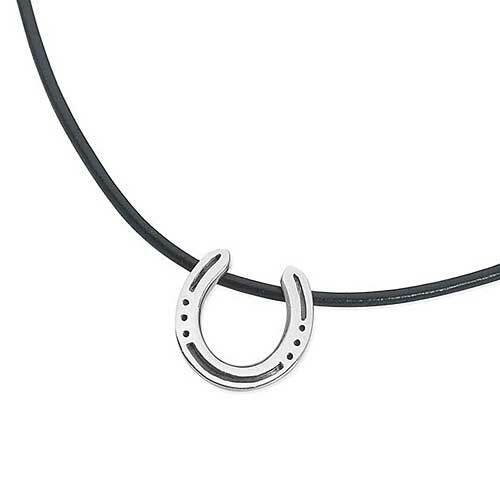 While we can't promise good fortune, this horseshoe pendant is beautifully designed to appeal to men. It is made from solid sterling silver and features grooved and worked detail for that added realism. Rather than dangling from the black leather necklace it has been cleverly joined by two eyelets on the reverse - one on either tip. The necklace has a secure fastener and measures 18 inches long as standard.